Finding meeting space in NYC isn't easy. Our conference rooms for rent can easily be reserved online 7 days a week and are available by the hour or by the day at preferential day rates. We offer conference room rentals at six prime locations in New York City, including midtown and the financial district. With a variety of sizes, you're sure to find the right NYC meeting room rental to make an impression on your clients. The corporate meeting spaces at Jay Suites locations feature the latest technology and will offer a comfortable environment in which your guests can convene, enhance your image, and boost your business. Our meeting rooms in NYC can be used for a variety of functions including sales meetings, company presentations, corporate trainings & seminars, depositions, interviews and more. Our conference spaces are available by the hour and can be booked online. When you rent a conference room, we offer teleconferencing, catering and comfortable and elegant furnishings. Rather than paying for the extra square footage in your office space, take advantage of the conference rooms for rent at Jay Suites where you can walk in and out and have everything you need including reception and catering already in place. Some of our past clients in our meeting rooms NYC include Goldman Sachs, Royal Caribbean and the New York Daily News. Focus on the content of your meeting rather than the set-up by choosing a conference room rental that offers more than just an open space. Jay Suites' meeting rooms for rent in NYC include AV equipment, Polycom teleconferencing, whiteboards, and optional catering packages. Your guests will be greeted by our friendly receptionists, and all of our New York City conference rooms are clean and stocked with contemporary and comfortable furnishings. Best of all, they can easily be booked online! 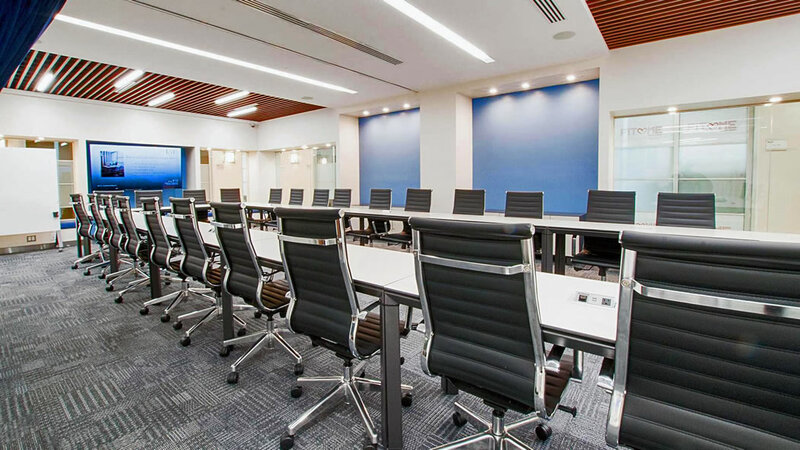 Meeting room rentals are available at multiple Jay Suites locations strategically situated near major NYC transportation hubs including Grand Central, Penn Station, Times Square and the Financial District. Since your clients may be coming from out-of-town, we've ensured that our corporate meeting spaces are located in convenient areas. Modern, Sustainable Wood Laminate Conference Table. Ergonomic Black Leather Executive Chairs. 55" Samsung High-Definition LED TV. VGA & HDMI inputs for personal computers. Modern, Oval White Marble Conference Table. 46" Samsung High-Definition LED TV. Modern, Round White Marble Conference Table. Modern, Sustainable Wood Laminate Conference Table & Matching Serving Credenza. VoIP HD Teleconferencing with Microphones at Table Ends. HDMI & VGA inputs for Personal Computers. Large Wall-Hung Whiteboard with Markers. Presentation Easel with Whiteboard & Markers. 46" Samsung High-Definition LED TV for your Presentations. VoIP High Definition Teleconferencing with Microphones at Table Ends. High-Definition Video Conferencing upon Request. 55" Samsung High-Definition LED TV for your Presentations. 60" Samsung High-Definition LED TV for your Presentations. 48" Samsung High-Definition LED TV for your Presentations. VGA input for personal computers. Frosted glass Executive conference table. 55" Samsung Ultra High-Definition 4K Smart LED TV for your Presentations. "If you're looking for sleek office space that's a cut above Regus, Jay Suites is a good find. Walk off the elevators, and you're treated to soft classical music, two TVs, friendly receptionists, and a very clean, contemporary, nondescript waiting area. I was invited here to lead a few training presentations in one of their conference rooms for rent and from a technology perspective, their setup is top notch. With support for video/teleconferencing and any local A/V hookup you can imagine, their conference room are top notch. I managed to peek into some of the offices on my way, and while they vary in size, they're all equipped with floor to ceiling glass, with most of it frosted to allow for some privacy while still keeping everything nice and bright. For business startups looking to get out of their basements that don't quite need their own huge offices, Jay Suites is a great place to call home!" "This office space has everything we look for in our business. The NYC conference rooms for rent are fully equipped and convenient for meeting with clients or visiting co-workers. Although I have the option to work from home, I find myself coming into the office every day to take advantage of all it has to offer: helpful/friendly staff, a fully-equipped kitchen complete with television screens, Starbucks coffee, and vending machines for snacks and soft drinks. Always neat and clean floors. Housekeeping staff is very accommodating. These guys often hosts parties at the terrace area... Overall an excellent office space." "We rented a corporate meeting space at the Jay Suites in the Financial District and we were very impressed by the accommodations. In addition, the ease of booking their conference room booking process online made it a breeze. We would definitely book their New York City meeting spaces again." We have partnered with a local New York City caterer Café Metro to offer exclusive catering packages including an executive breakfast, different lunch options, sweet and salty snacks as well as Starbucks Coffee. Catering is also available for any weekend meeting rooms for rent reservations. We are happy to provide recommendations for catering in the area if you desire to make your own arrangements as well. We also offer several business services with our conference room for rent such as office supplies, color copies, faxing, and scanning upon request. Perfect for industries across the board, our sophisticated meeting rooms for rent are available at affordable rates and can easily be reserved online or on your phone with our mobile-friendly proprietary member portal. Our team of professional staff is on-site and ready to assist at a moment's notice with any questions or concerns. We make it a point to check in after you have arrived to make sure you have everything you need to make your meeting a success! Jay Suites' dedication to provide unwavering personalized customer service is what makes our NYC corporate conference spaces stand out from the competition. Jay Suites provides superior executive conference rooms for rent are guaranteed to make a lasting impression on you and your clients. Why conduct confidential meetings in a public space like Starbucks, when you can enjoy the Starbucks coffee we are proud to offer in one of our private conference rooms? With access to over 23 meeting spaces centrally located throughout Manhattan, our conference space ranges in size of occupancy from 5 to 52 guests. Our conference room rentals are available Monday through Sunday from 9 AM to 7 PM, with a 4 hour minimum for weekend bookings. If you need a conference space off hours, do not hesitate to reach out to us via our online contact form and we will try to be as accommodating as possible. Our conference spaces are equipped with Samsung LED TVs, HDMI and VGA inputs for PC and Mac presentations as well as polycom conference phones to meet all of your audio and visual needs. We offer the latest in telecommunications equipment and presentation tools that can power all of your mobile devices from tablets to laptops. Our conference room rental service provides Chromecast capabilities, whiteboards, and optional catering packages available. We're happy to accommodate any technical specifications upon request. In New York City for an important meeting? Please see our list of hotels in the area, all located just minutes away from our meeting rooms! When you are on a business trip and rent a conference room with Jay Suites, you can take comfort in knowing there are many options for lodgings in the area. Classic cool. Curated comfort. This is The Gregory. Housed in the site of the former Gregorian Hotel, The Gregory is a new luxury Herald Square Hotel. NYC's history, culture, and haute couture run through our halls. Restored and reborn in 2015, The Gregory is a star among boutique hotels in Midtown Manhattan. Bright, innovative and inviting, LUMA Hotel Times Square is the newest boutique hotel in Midtown Manhattan. Tucked away on a street adjacent to Bryant Park and a few steps away from Times Square, LUMA's slim glass facade illuminates the City's skyline. A hotel should be more than just a place to stay. Your comfort, your curiosity, and your love of the details large and small make the experience. So, with you in mind - we have designed Archer Hotel, a boutique hotel collection filled with curated luxuries and a sincere staff dedicated to your service. Archer New York, our Midtown Manhattan hotel, and Archer Austin, in its buzzy Domain NORTHSIDE neighborhood, are TripAdvisor favorites. In a town full of movers and shakers, W New York- Downtown is the ultimate power player. This Financial District favorite is home to stellar city style and boundless energy, offering insider access to the best of downtown Manhattan and beyond. Contact us at (212) 569-9000 and rent a conference room with Jay Suites today!